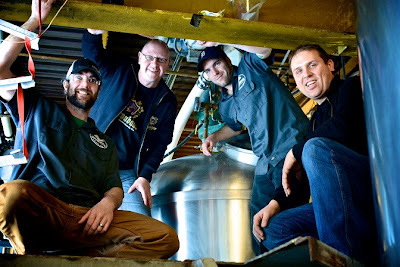 The Corner Brewery crew collaborated with two Belgian brewers on February 7 to create Mundus Novus Rye Chocolate Dubbel Ale, releasing today at Arbor Brewing. Photo by Frederic Culpepper. From Belgium to Hollywood, your globe-trotting Week in Beer has the goods. So much of the goods, in fact, that it's hard to keep up. But whenever I think of all my thirsty readers who might miss out on something awesome if I didn't tell them about it, well, I just can't slow down. Are you ready for another turbo deluxe supercharged plus-sized information dump? Let's do it. » A bit of Belgium comes to downtown Ann Arbor from 4-7 p.m. during the release party for two collaboration beers brewed by Arbor Brewing and Ghent, Belgium's Brouwerij de Musketiers, makers of the Troubadour series of beers. The collaboration brews include Mundus Vetus (Old World) Rye Tripel Ale, brewed in Ghent, and Mundus Novus (New World) Rye Chocolate Dubbel Ale, brewed at the Corner Brewery in Ypsilanti. Also on tap will be a few other awesome Troubadour beers: Antigoon Double Blonde Ale, Troubadour Magma, and Troubadour Obscura. Brewers Stefaan Soetemans and Kristof Deroo will be joining in via Skype from Ghent for an international toast. » Wine has long dominated as the elegant choice for cheese pairings, but beer is fast catching up. See how the two stack up at the Beer vs. Wine Taste-Off from 6 to 8:30 p.m. at babo market, 403 Washington. Cost is only $12 for five pairings; pay at the door and you’re in. Visit babo's blog for more information and to see the full menu. » More beer and food pairing is going down at Grange Kitchen & Bar, 118 W. Liberty, beginning at 6:30 p.m. Chef Brandon Johns is using locally sourced ingredients and matching them up with beers from Short's like Ginger in the Rye Ale, Joyous Almondo Brown Ale, Huma Lupa Licious IPA, and more. Event is likely sold out, but you never know when someone is going to cancel, etc. Tickets are $55 excluding tax and tip and can be purchased here, if available. » Who loves beer? Women do. (So do men, but that's, like, duh.) Find out how much at a 6:30 p.m. screening of The Love of Beer at the Wolverine State Brewing taproom, 2019 W. Stadium, co-sponsored by Whole Foods. Following the film, join Wolverine's Beer Wench E.T. Crowe as she leads an educational beer tasting session. Admission is $5, which will be donated to Slow Food Huron Valley. Must be 21 for the tasting part, natch. » And while we're on the subject of Whole Foods, this is a good time to mention the Midland Brewing Co. happy hour at the Cranbrook location, 990 W. Eisenhower, from 5-7 p.m. Enjoy $3 glasses ($1 samples) of an as-yet-unknown number of as-yet-to-be-determined beers from your correspondent's old stomping grounds at the elegant environment of the Wine and Beer Bar, located, of course, by the cheese. » Bill’s Beer Garden, 218 S. Ashley, has announced another "pop-up" weekend before the regular season commences May 2. Enjoy brews at downtown Ann Arbor's premier (and only) beer garden this Friday and Saturday 7-11 p.m. and Sunday 5-9 p.m. With any luck, you will not need a parka. » Drop in to The Produce Station, 1629 S. State, for your weekly dose of free beer. Samples of Bell's beer will be available from 5-7 p.m. As of this writing, which Bell's beers will be sampled is unknown. You'd better go and report back to me. » Miss out on Thursday's Arbor/Troubadour collaboration beer release? Head to Fraser's Pub, 2045 Packard, where both beers will be tapped at 6 p.m. Arbor folks will also be on hand to toast and talk about what it was like brewing with Belgians. » It's that time of year when Arbor Brewing pays annual tribute to its namesake holiday, Arbor Day, by partnering with Ann Arbor's Adopt-a-Park for a fundraiser that the Lorax would totally get behind. On tap look for Spruce Ale, the proceeds from which will help underwrite tree plantings throughout the city's park system. Drink some tree beer for the trees! » Ashley's, 338 S. State, continues its exclusive beer releases commemorating 30 years in the bar business with Admiral Ashley's Imperial Fugglelicious 30th Anniversary IPA, brewed up specially by Short's using... wait for it... fresh whole-leaf Fuggles hops. Tapping is at 6 p.m., and there are sure to be other great draft Short's beers pouring as well. » Up in Howell, the Shark Club, 1140 S. Michigan, is hosting its annual Short's De Mayo celebration in honor of the famous Mexican holiday. Fifteen beers from Short's, including Aorta Ale, Rye Not?, Hopstache, Ginger in the Rye, and plenty more, will gush forth from the taps while you enjoy your quesadilla and explain why you don't need no stinkin' badges. Four breweries (with a fifth on the way) inside the city limits. Six others a short drive away. A legendary 72-tap beer bar atop a list of many other decades-old neighborhood watering holes. Great festivals like Oktoberfest, German Park, and (just down the road) the Michigan Brewers Guild Summer Beer Festival. A rich brewing heritage. Great restaurants that host some incredible beer dinners. A vibrant homebrewing community dating back to the early 1980s. These are just some of the reasons you should vote to nominate Ann Arbor for the 2013 Beer City USA poll. You don't have to register for anything, or give your email address, or do anything other than click your mouse twice. Ann Arbor needs 400 votes to get onto the main poll, where it will go up against the likes of Grand Rapids; Portland, Ore.; and Asheville, N.C. Vote here and let's get A2 on the list! Do it now, as voting ends April 26. Is it tea? Is it beer? However you want to categorize it, it's delicious, and now you can belly up to the bar and try it at Unity Vibration's new tasting room. It's kombucha beer, and it comes in an increasing number of flavors. Unity, which set up operations at 93 Emerick St. in Ypsilanti about a year ago, is expanding into markets in California, Florida, New York, and elsewhere, but it remains committed to the local community. Read all about Unity Vibration and their unique beverages in this AnnArbor.com story by Tom Perkins. Homebrewers: Registration is now open for the 7th Annual Brews Crews Competition, to take place at the Corner Brewery, 720 Norris, Ypsilanti, June 8. For more details on drop-off points and times, etc., etc. check out brewscrews.aabg.org or the event's official Facebook page. Are you into crafts as well as craft beer? Fashion a cool hat mixing the themes of the Kentucky Derby and beer and you could win a case of Wolverine beer at Wolverine's May 4 Derby-themed party. More details here. Tickets are on sale for the May 23 Craft Brew-Haha beer dinner at Paesano, 3411 Washtenaw. Five courses paired with beers from Arbor, Original Gravity, and Great Lakes Brewing are on the menu. Cost is $45 per person (exluding tax and tip). Call 734-971-0484 to reserve, and check out the mouthwatering menu here. Robert Redford's new movie, The Company You Keep, opens Friday at the Michigan Theater. Although it was filmed entirely in Canada, there are scenes set in Ann Arbor. I haven't seen the movie, but if you do, look to see if Arbor Brewing makes a cameo in the form of a wall poster. Some time ago I sent the set decorators said poster along with other Michigan beerphernalia, so hopefully something made it into the finished product.